Hoe and Shovel: Did I Mention My Visitors From The North? Did I Mention My Visitors From The North? After two damaging hard freezes in the past three weeks we're back to Florida winter as usual around here. Blue skies and lots of sunshine with cool nights and warm, pleasant days. This is my favorite time of the year! ... Especially exhilerating to be in the garden. Yes, it is a good time to visit. Florida's tourist income spikes in the winter from so many folks up north hankering for some sunshine. This week Hoe and Shovel will have some special visitors from the north. Today, Kylee, from Our Little Acre is stopping by with her aunt and daughter. They are here from Ohio and staying for a week in Bradenton, just 1.5 hours south of here. Kylee and I talked on the phone for a long time today. I am excited about meeting her in person and giving her a tour of the garden. Then on Wednesday, Marmee, from Things I Love, who happens to be my one and only sister will be here to stay with me for a week. I'm remembering Gail's recent post --- "I'm looking at the garden with your eyes." They are kinder, gentler than mine, right? It's going to help me give the garden tour to my visitors without complaining about what poor winter-shape it is in. You see, all I can see when I look at my garden right now are the many plants that usually look great this time of year but were burned by the unusual frosts we've had. I promised I wouldn't lament over it too much since most of it will come back. It's just that, well, my garden really would have looked good for visitors at any other time than right now. So today I tried to find the bright spots because truthfully there is still a fair amount of green to be seen if one can try really hard to look past all the brown drooping freezer burn. Parsley must like this weather. It is just beautiful and full in spite of the cold. Maybe my visitors will notice the parsley and not the wilty Amaryllis leaves or the black and drooping firespike in the background. 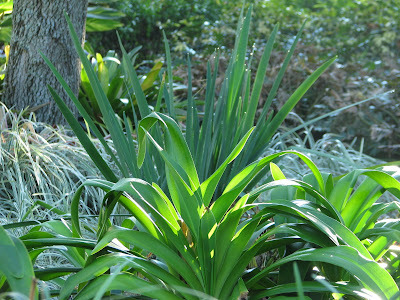 The Louisiana Iris and Agapanthus plants in the second photo stood right up to old man winter. I'm proud of them. Since I'm paying close attention to the leaders in the garden ... those that don't cower or fold under pressure... I'm going to be giving them more and more reign in the future. It's a time to be thankful for good bones. 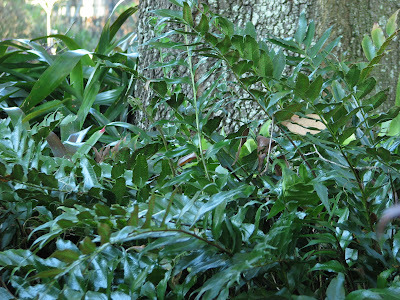 The oak trees came in handy for sheltering the holly fern, most of the bromeliads and the variegated gingers (in the first photo). Holly fern has turned out to be surprisingly hardy and yet not as invasive as most ferns. It's going to be rewarded this spring. I'll be digging it up and dividing it since it performed so well in the toughest of times. Then there are the potted plants. If they were small enough to move they were carted inside on the nights it got down to freezing. They kind of stick out now, simply because they're still alive, rather than blending in to the landscape as they normally do. The only flowers blooming are the few in the container plants that were moved and the new ones purchased recently for the vegetable garden companions. We'll just have to put on our kinder, gentler eyes and spend our time looking at "what did survive" and we'll be grateful for family and friends who come to visit. I'm looking forward to it, Kylee and Marmee. Welcome to the Sunshine State! No, I didn't know you were having company. Don't worry about your freeze damage. Beleive me we Northerners are used to such damage and we won't even notice what with all the other beautiful things going on in your garden. Did anyone come get the peacocks? I am glad the damage from all the cold wasn't any worse than it turned out to bed. BTW- thanks for sharing you FL weather with some of us here. We have had a gorgeous several days and everyone seems to be taking advantage of it...unless you work the first three days of the week. Oh well, no complaining, right? Enjoy your company! I am glad the weather has changed for the better. What a wonderful time to look forward to, I just love having visitors to my garden. Any good gardener will know how beautiful a garden is whether it has been frost damaged or like mine needs weeding. I am sure the visit will go down well, and serve them some of your homemade goodies. That will seal the deal and leave them with memories for a lifetime LOL. BTW anyone coming south to the islands please drop by for a visit too LOL. Kylee and Marmee will be so thrilled to spend time with you that neither will notice a few damaged plants....Your garden has fantastic bones, lovely plantings, but more then that it is suffused with your spirit~~kindness, gentleness and a whole bunch of goodness! ~~and it's beautiful. Have a delicious day and thank you for the love link! 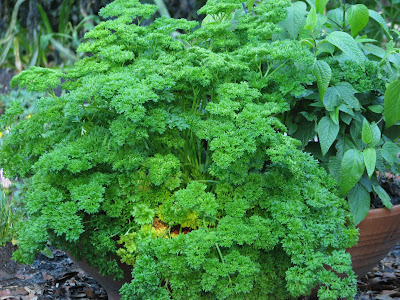 You're right about parsley and Osteos--they like cool weather just fine. Osteos puzzle me-in the spring, if they get a chill they'll pout, but once they're established they will flower right into a hard, killing frost, even shaking off a little snow. 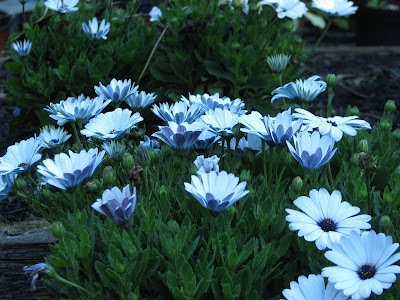 So do other African daisies--I guess the cool temperatures some places get at night in AFrica have built in the cold-resistance. I'm glad you're having company, especially Kylee. Give her a hug from me, please, and have a great time! Despite your colder weather, your garden still looks wonderful through these eyes. :) Enjoy your visit with Kylee -- how exciting! Relax -- your garden has beautiful bones! Like a model without her makeup, her real beauty will shine through. No worries! Enjoy your day with Kylee. It's so wonderful when we get to meet our "virtual" gardening friends. I went through similar angst last fall when some cottage garden forum friends came to visit from Virginia. It was all fine and we had a fantastic time together. I agree with Lisa, your garden will be a feast for the eyes just because there is something still green. We have no color here right now. How exciting that you and Kylee get to meet each other! Have a great time! I'm sure your garden still looks beautiful in spite of the damaging freezes. The large oaks are great at sheltering the plants beneath them. I don't know why anyone wouldn't want a yard full of them. I was surprised to see that my pots of parsley and dill also survived the cold nights. I didn't bring them in and figured they would be gone. They seem so tender. Meems, I don't think you need worry about a little frost damage. 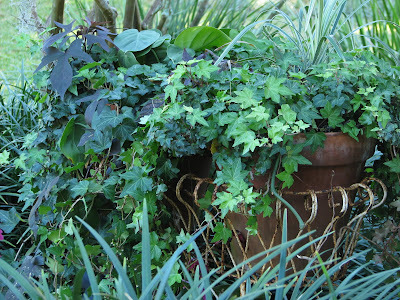 Gardeners from Ohio and even Tennessee will be awed by the variety of plants actually growing in February. They will be in paradise. I'm sure your guests are there as much for you as they are for your garden and will understand completely the many moods of Mother Nature. If they are true gardeners they have been tested many times themselves which breeds forgiveness for a less than spectacular showing. They'll probably be interested in seeing the one's that "made it" to add to their own list of winners. I know I was. My list of winners was way shorter than the list of losers. This was a brutal freeze for us. The winners for me were the carolina jessamine, knockout roses, bamboo, daylilies, African irises and rosemary plus the usual cold weather beauties of petunias and pansies. I am curious about the peacocks too. 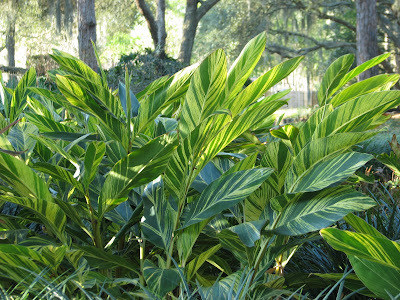 You still have beautiful plants to show off to your visitors, you should be proud. At least Old man winter took your plants down and not a mean ole' neighbor, yeah come read this one. I can't believe everything you have in bloom (or at least in "green"). I'm sure Kylee will fill you in on what it's like in Ohio, and Michigan is a bit colder still! We have the same problems as you w/ our garden.Now that the weather has turned warmer,it's even harder to be patient.Your garden is beautiful. I must agree with the other northerners-any and everything green will belovely to them. I hope you enjoy your visitors and DO have lots of fun! Your variegated ginger, backlit with sunlight is award worthy. I like your attitude about the less than perfect garden. And it's true. I saw not one winter damaged plant in those photos. And as Lisa says, your northern friends are going to be happy to see GREEN. :-) Have fun! Hi Meems.....I am sure that your garden will look beautiful even with the winter damage...beauty is in the eye of the beholder. How nice that Kylie is coming to visit. Have fun! I hope you've been enjoying your visitors Meems. I'm sure they loved seeing your garden in spite of the freeze damage. We're just seeing bare ground for the first time since late December thanks to a February thaw. The garden has been buried under several inches of snow, and it's nice to see the ground again, even if it's all still brown here. I can't tell from these pics that you had some damaging weather. Things (you showed) are looking lovely, as usual. I saw Kylee's post about the trip. It sounds like you had a fun time together. I'm curious about the peacocks, too. I am certain that Kylee enjoyed every minute of her time in your paradise! Freeze or not, I hope you had a blast! You must be in heaven, Meems! Had fun catching up (Kylee's teeth must be amazing ... joke ... we're both hygienists) and days spent with Marmee, delightful (thank God for sisters). Happy Valentine's Day!